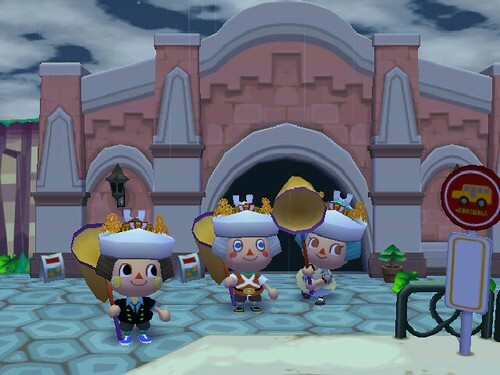 Helloooooo out there in Animal Crossing land! Anyone still out there anymore? lol! Sorry I haven’t posted in a while. Frankly, I’m a little disappointed in myself for forgetting to post about last month’s DLC. I’ll get to that in a minute. OK back to today’s blog entry! I will have to backtrack to May because I apparently forgot to blog about the DLC we received in America! If I’m not mistaken, the Guard’s Uniform is the first US DLC to be released with TWO parts – a hat AND a shirt pattern. Both Pete and Wendell accosted me and brought me the new items. Of course, オレンジ and I had arranged to meet up so I could share the new DLC with him. Also I wanted to have a mini photo shoot with the OFFICIAL Shaolin Guards. We became honorary members! Check out how cute we are! 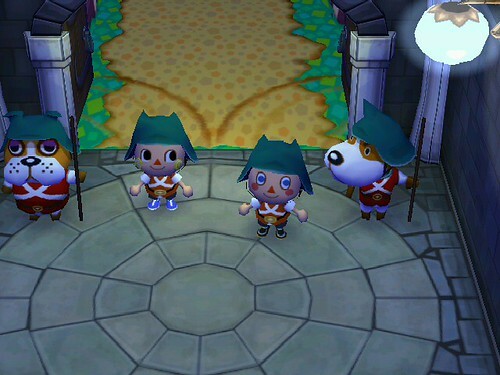 Copper seemed to like how we were trying to dress up like him and his buddy. Booker… wasn’t paying attention. As usual. What a space cadet! Sometimes I wonder about trusting him with the important job of… telling me what’s new. And the lost and found. Seems like too much responsibility for someone who’s mentally ‘checked out’ all the time lol! Needless to say, King Squirt has since changed his name to Royal Guard Squirt, Defender of Shaolin! About a month passed without any new DLC items. Then, this past week, things changed! In South Korea, new DLC was released in time for the World Cup! I can’t tell you what the hat and pattern are officially called, because I don’t know how to read Korean. I can barely read Japanese! Gimme a break here. 😛 But here’s a photo of オレンジ, Vella, and me modeling the new apparel! I’m not entirely sure what the “horned hat” has to do with the soccer jersey exactly. But it’s really cute and I had big plans for mine! But before I get into that, there was more DLC to be had! Just today in Japan, a new DLC was distributed as well. It is called つのかくし (Tsunokakushi). It is a traditional Japanese Wedding headdress. 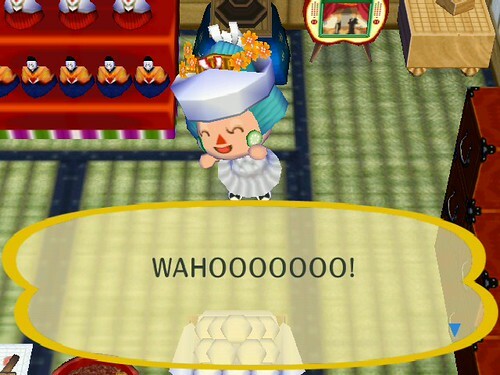 Meanwhile, my alter ego Deb is the character with the Japanese themed house. So it only seemed fitting to let her have the Tsunokakushi. Especially since Deb is the fashionista who has all the GracieGrace fashions, including the Cake Shirt! So Deb looks like an OFFICIAL Japanese Bride! Cute! I love how two of the three “brides” are male. What kind of weddings are we having there? They should be PC and release groom things too because you’re right, Squirt is not a very attractive bride. 😉 Deb however is (even if she is killing cockroaches in her bridal attire). I’m not playing much at all, but I still have fun wifiing with everyone. I’ll try to make it to more of the DLC swaps. If I put it in my Calendar I can remember it. lol. I must be getting old. I need alarms to play AC. OMG haiiiiiiiiiiiii! Remember me? We wi-fi’d once. 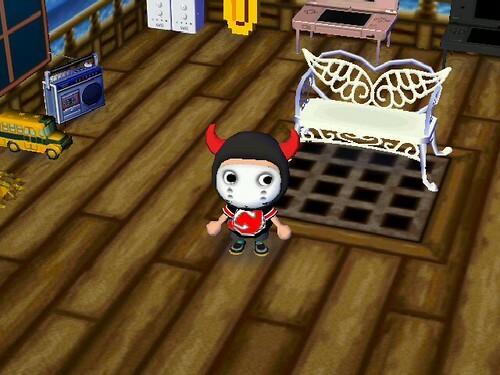 I love the 3DS, but when I saw the animal crossing screenshots I was kinda dissapointed. They all look WAY too tall, like they are stuppost to be mimicing basketball players or something.